So many people get confused between Social Media and Social Business. Let's make it really simple to understand. A Social Business is about People, People, People! Social Media is about technology! Social Media has a role to play with helping to enable the Social Business. This post is just an example of what I do to integrate 'Social' into my business or sales process. I spend time on Facebook and Twitter (mainly twitter) to connect with people in an engaging way. The great thing about Twitter is that I can easily engage with people without going through traditional methods. In sales, if you try to pick up the phone to call someone, whom you have no relationship with, you often find the calls being screened by the telephonist, and you're not wanted! Not the case with Twitter, I can identify the people I want to engage with and begin building a relationship from there. I often end up meeting with people who I have engaged with through the use of social media. 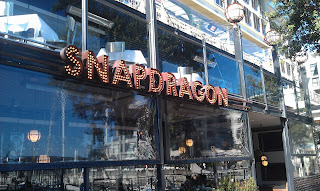 Last night I was having dinner at SnapDragon down at the Auckland Waterfront. While there I noticed that someone I had been communicating with on Twitter was up from Wellington, Ben Irving. I sent him a tweet and suggested that we could catch up if he was around. Within minutes, I received a reply and ended up meeting with him and some of his business colleagues just two doors down from where I was. A simple tweet meant that I was able to build on a relationship which started out on twitter. Not only that, but I was also able to build new relationships with another 4 people. Bonus! This is not a one off but it is a regular occurrence. Blogging - Sharing what you know with people without expecting anything in return is a great way to demonstrate that you're a Subject Matter Expert (SME). In English, it's a great way to show that you know what your talking about. Be responsive - By responding to people, they know that you're for real and that you really do care. Sometimes I send a tweet to someone with thousands of followers on Twitter. I don't always get a response. This makes me think that they're some sort of an automated system. If someone makes contact with you, then acknowledge it as the least. From a simple message on twitter we have had a couple of significant meetings in real life. It has been great trying yo help you where possible.